Football-related racism has long been viewed as an ongoing problem in Russia with several instances of discrimination even though the authorities bent over backwards in the build-up to last summer’s World Cup to suggest it was no worse than anywhere else. 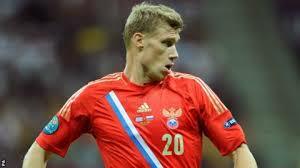 But now Pogrebnyak has come under scrutiny over publicly aired comments about Brazilian-born, naturalised Russian striker Ariclenes da Silva Ferreira, also known as Ari, who plays for Krasnodar and has two caps for his new national side. “It’s weird when a black player plays for the Russian national team,” 35-year-old Pogrebnyak, who won 33 caps, said in an interview with the Komsomolskaya Pravda tabloid. “I am against [the naturalisation of foreign footballers]. I don’t understand the point of it, I don’t understand why Ari got a Russian passport,” Pogrebnyak, who in the past has played in the English Premier League and German Bundesliga, was quoted as saying. Alexander Baranov, deputy chief of the Russian Premier League’s anti-discrimination committee, told TASS that Pogrebnyak, who now plays in the Russian top flight for Ural Yekaterinburg, might be suspended or fined for his remarks while Mikhail Fedotov, head of the presidential Human Rights Council in Russia, said the Russia striker’s comments “smelt of racism”.